There is just so much to take in, and to make best use of the wind and enjoy the full experience, Steady does not run to specific itineraries on this voyage. 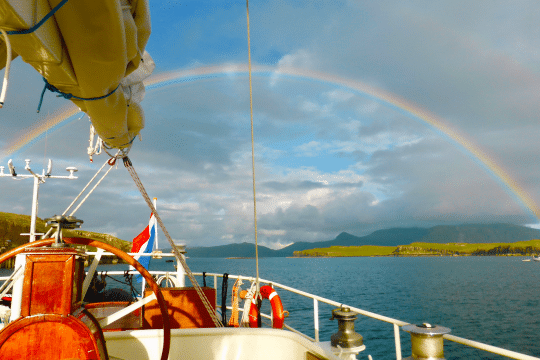 Tacking the ship westward through the Sound Of Mull, you could head out beyond Ardnamurchan Point and alter course to the North or South or Westwards to Barra and beyond. Taking the Southerly heading, follow the majestic coastline of Mull down past Treshnish and on to Staffa. A visit to Fingal’s cave is a must, but landing is very much dependant on swell. Beyond lies the sacred isle of Iona where the resonance of Columba lives on. Onwards, the ship will pass Torrans Rocks where Davy Balfour was wrecked in a tremendous storm, finally being washed ashore on Erraid. Heading on south to Colonsay, stop for the night alongside the pier and walk through the crew’s favourite islands for its gentle beauty and of course to taste some great ales from smallest island brewery in the world. The Northern route takes Steady on and out to the more remote Hebridean Isles. Rum, by far the largest island, possesses a cluster of formidable volcanic peaks, Askival (Ash Mountain) the highest peak, dominates the landscape, and the name itself tells of the Viking settlers here. 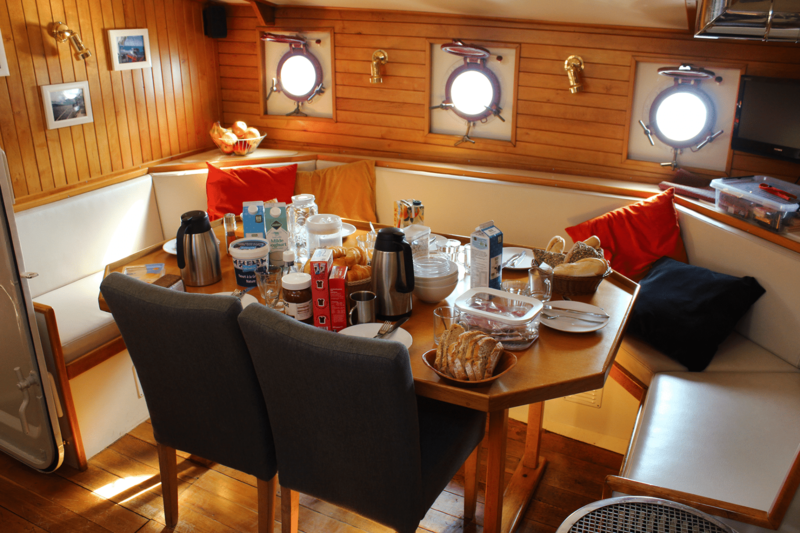 If you are fortunate with settled weather, the crew will want to take you to one of the most awesome anchorages in the world. Nestling at the foot of the Skye Cuillins lies Loch Scavaig, the sea loch with the waters of Loch Corusk pouring in. Follow the trail and you feel like you have walked right into middle earth. Eigg, which measures just 5 by 3 miles, is by far the most vibrant, populous and welcoming of the Small Isles. There are wonderful views of Muck and Rhum from An Sgurr. Canna, in many ways, is the prettiest of the isles with its high basalt cliffs which are home to a colony of Puffins. Spend time lying on the cliff edge as they hover a few inches away before darting off to catch more eels. After anchoring for the night, allow yourself to succumb to the tranquillity of the island knowing there is little to do but walk, watch birds and take in the scenery and the hospitality of this island community.